The jewel of Northern Africa, Morocco boasts spectacular historic architecture, busy cities, huge ancient markets and staggering nature. Plan your holiday to Morocco, which attracts various people for various reasons. Chose yours! The opulent building is dedicated to Moulay Ismaïl Ibn Sharif also known as the “Warrior King”, who has built the city of Meknès and made it Morocco’s capital at the time. The 18th century Mausoleum is a fine example of Moroccan architecture. The Moroccans themselves are very proud of this structure and regard it as one of the best buildings in the country, reflecting its style and grandeur. Carved by the Dades River, the gorge separates the Atlas from the Anti-Atlas mountains. The gorge leads to the Berberian kasbahs, that have become a popular tourist destination recently. The road provides breathtaking views to the Dades Valley and historic sites. The very authentic Berber town in the Anti-Atlas mountains is an ancient oasis. Surrounded by the steep cliffs, the town attracts adventurers, climbers and tourists, who are willing to explore true Morocco. The guests can stay in the hotels and enjoy the true tranquility an oasis can offer. One of the most recognizable towns in the world, Chefchaouen is a truly unique settlement. The mystic blue color dominates the cityscape. Visitors come here to wander the picturesque streets and admire local architecture. Besides exploring the authentic town, visit the markets, where you can purchase local handcrafts and spices. The mountains are a symbol of Northern Africa and have been an inspiration for the artists. The landscape ranges from the snowy peaks to green valleys and pastures. Hiking provides a delightful experience. 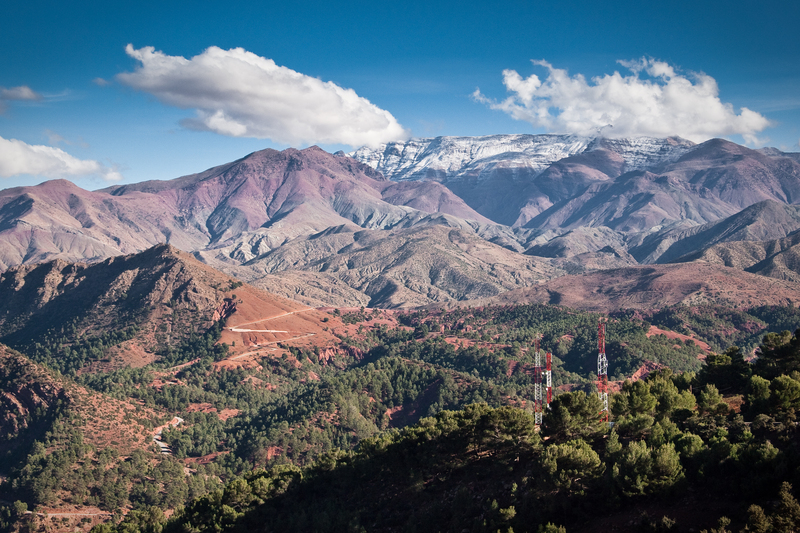 Visiting the mountains is a must-see-and-do once in Morocco. Go to the Ouirgane National Park, Ourika valley and Ouirgane – the most popular tourist destinations. The largest and may we say the most iconic city in Morocco is also a chief port. It boasts spectacular architecture from various eras including the French period. The city attracts many students to its universities and colleges. Therefore it maintains its youthful spirit and hosts a number of events. Marrakesh is among the four most important cities in the country. It boasts numerous cultural landmarks, that are gorgeous to admire. It also hosts the largest market in Morroco, where one can purchase original handcrafts, spices and leathers. Visit its royal gardens, local markets and experience the hospitality of the locals. One of the most popular resort towns, Tangier attracts visitors from all around the world. It boasts great resorts, a long coast with sandy beaches, that a liked by the bathers as well as the surfboarders. The picturesque city is packed with historic landmarks, that also attract movie makers, who endorse the beauty. The capital city boasts great historic museum, a huge theatre in the middle of town and numerous other historic buildings. It also hosts Mawazine – an annual music festival, which attracts crowds from around the country. It might qualify as the most beautiful city in Morroco! The second largest city in the country used to be a capital until 1925. It is a cradle of culture and is dubbed to be the Athens of Africa. Protected by UNESCO, Fez boasts an abundance of historic heritage. Admire the truly stunning buildings, which represents the Moroccan architecture very well.